I'm a visual thinker. 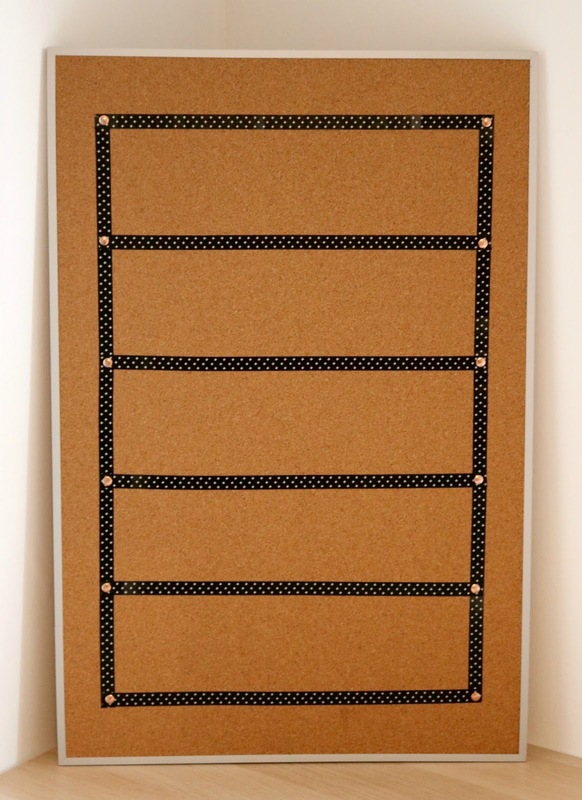 I draw things out, write millions of notes and have hundreds of notebooks filled with ideas.... but I'm also a bit of a neat freak... so when it came to creating my new office, I knew I wanted a neater solution for my post it notes. 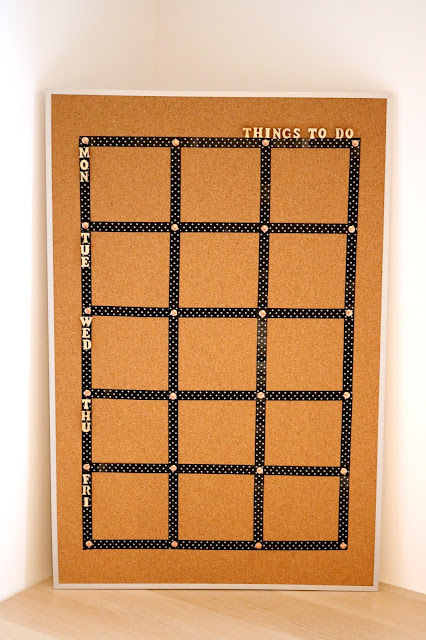 Whilst I wasn't planning on sharing this DIY To Do List/Weekly Calendar on the blog, I decided I had to share it after having quite a few of my friends ask me where I bought it from. You see, I knew exactly what I wanted in a weekly calendar/to-do list but I couldn't find one that fit my room or fit my needs in stores (or online) - so I set to work in making my own. 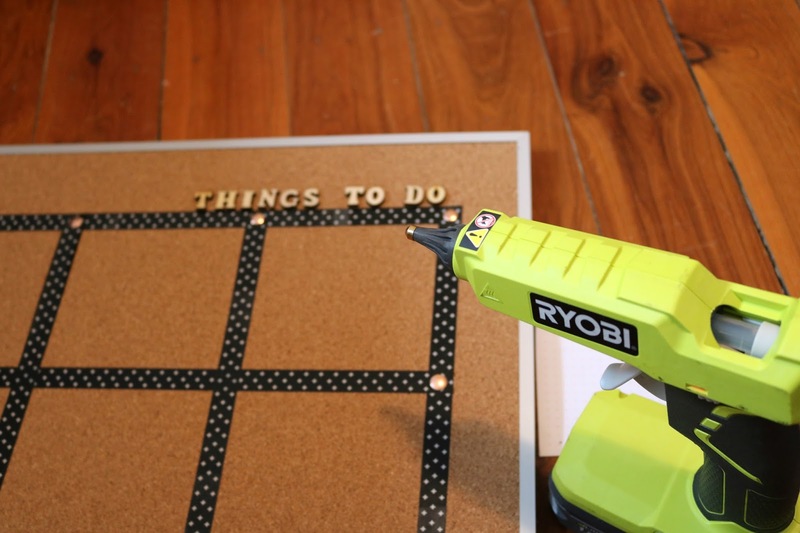 This may be the world's easiest DIY project ever - but it's one I'm so glad I did as I use it on a daily basis - and it's stopped me from covering my desk and computer in post it notes that always happen to get lost under one another - and that's a huge win in my books. Best of all? You can personalise it to suit you. Use it as a meal planning menu board, add your kids before and after school activities or chores, use it as a calendar - the possibilities are endless! First you'll want to start by measuring up your board and deciding how many columns/rows you want your board to have. I decided on three columns of five rows as I like to divide my work days into three sections (so I can devote a certain period of time to a task before moving onto the next one) so I could have a to-do list for each day of the week. How many columns and rows you choose is completely up to you. I measured mine to make sure they'd fit the note squares that I wanted to use - but you could also use smaller pieces of paper/sticky notes instead. Once you've worked out your measurements, it's time to place your border. Stick your washi tape directly onto your cork board, forming the border. It's quite easy to get it straight if you cut straight at the end of each row as you can line up each piece - but use a ruler or measuring tape to help you if you need! 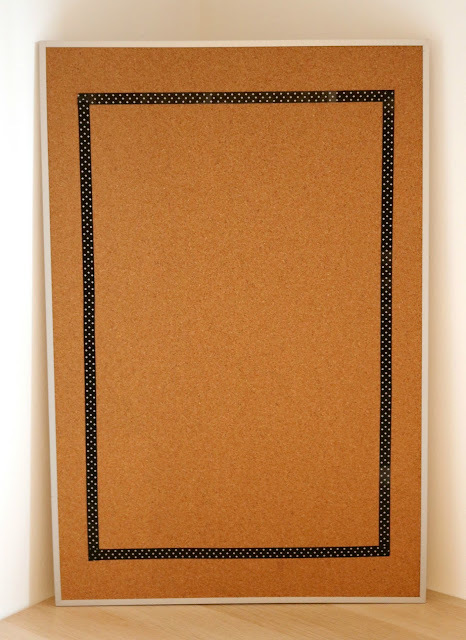 Once you've added your border, add a thumbtack to each corner to hold the tape in place (as it may unstick over time). Next, add your rows. using your ruler or measuring tape if needed to space everything out evenly (you'll notice here that my bottom two rows aren't quite even.... haha). 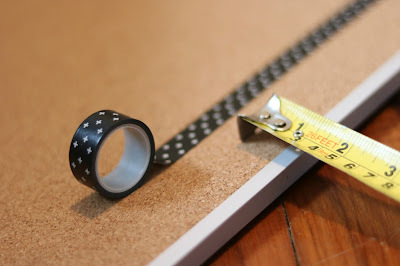 Like with the border, add a thumbtack to the end of each piece of tape to secure it in place. Repeat the same process again, adding your columns and securing the ends of each piece of tape with a thumbtack. 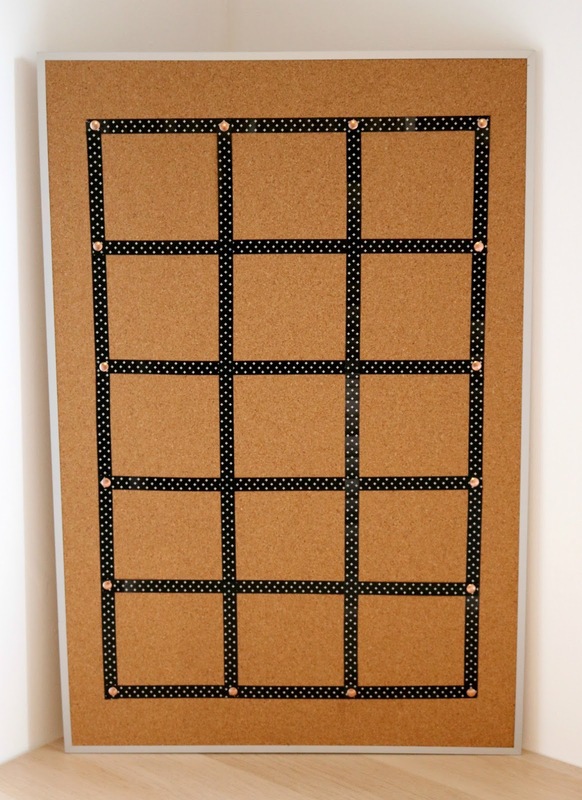 If you're doing a weekly board, add some letters so you know what column/row is what! Stickers may or may not stick to a cork board - so I decided to go the more permanent route with wooden letters and a hot glue gun! 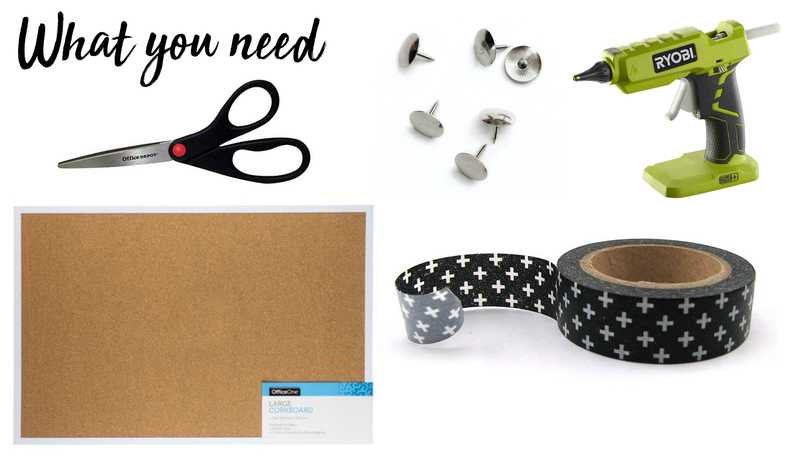 The weekday letters were stuck onto the tape so they'll be easy to take off - and the "Things To Do" ones were stuck on with just a few dots of glue so they can be easily removed and the board can be reused if you decide to use it for something else later. And after all of that, you're ready to use it! Mine currently sits on the other side of my desk where I can easily see it (and don't worry, it's not on fire in that photo - that's just the candle light in front of it reflecting on the white paper) so I never forget what I have planned. 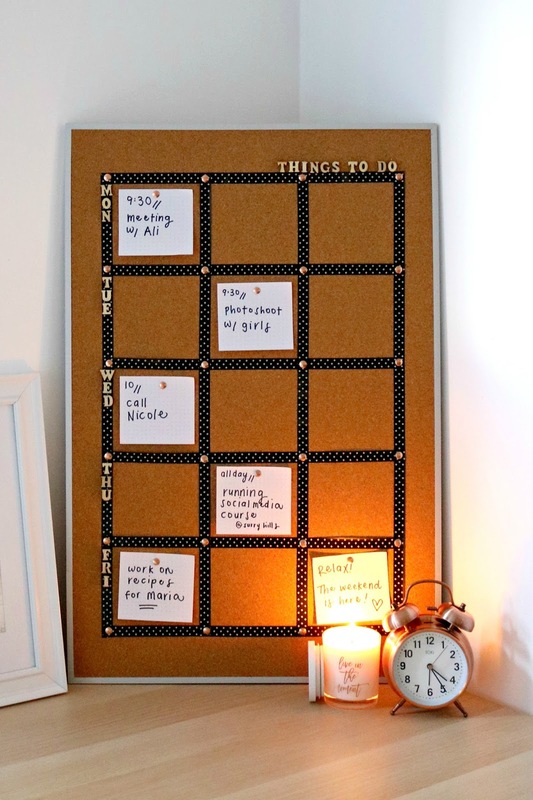 When things come up and you have to shuffle everything about, it's easy to reorganise your to-do's as it's just a matter of taking the pin off and pinning it somewhere else. 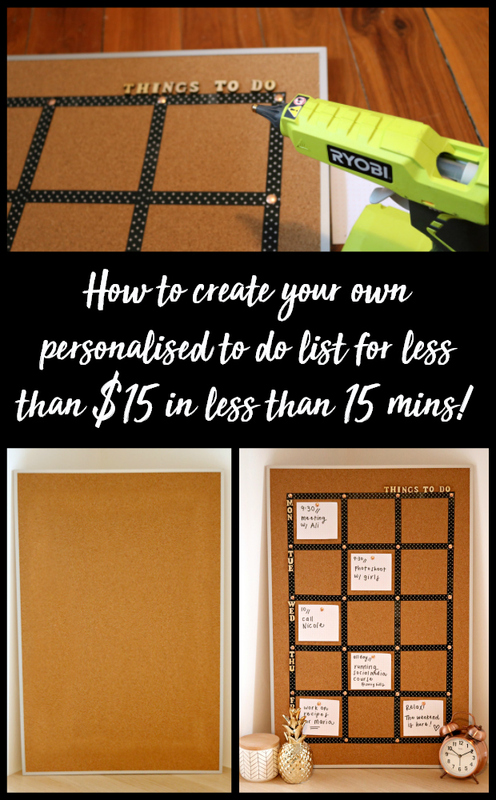 Super easy and super organised! Are you a list maker? A planner addict? Or do you just go with the flow? How do you keep up with everything you have going on in your life?